Dreaming of a barefoot beach blessing, a sumptuous day infused with the spirit of India, or a seriously stylish celebration as the sun melts into the Arabian ocean? For the past seven years we have been designing dream destination weddings in Goa, handling every aspect of the planning process, from the “how do we make this happen?” to ensuring everything runs smoothly on the big day. We are a British team with a background in design and event management (so your wedding will be styled and planned to perfection!) but based in Goa, giving us the on-the-ground knowledge and contacts to turn your ideas into reality. 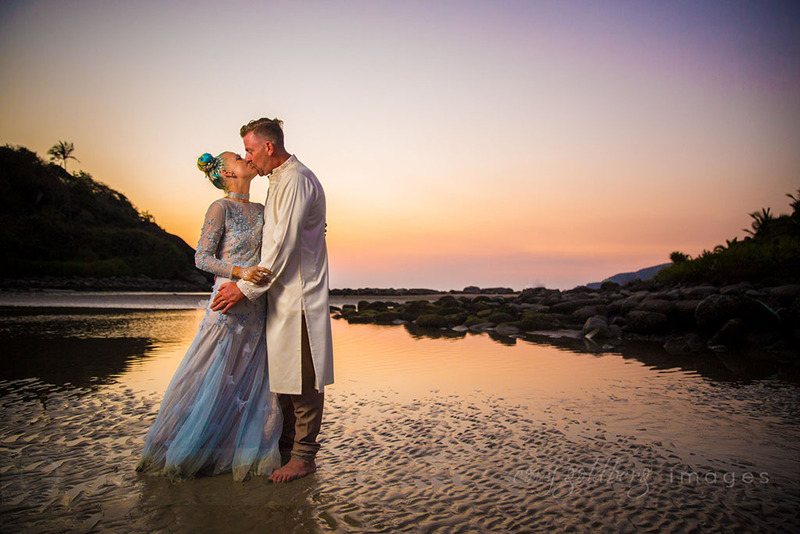 Every destination wedding we organise is completely unique – we are not a travel company or hotel chain bolting on identikit ‘Goa weddings’ as an extra. 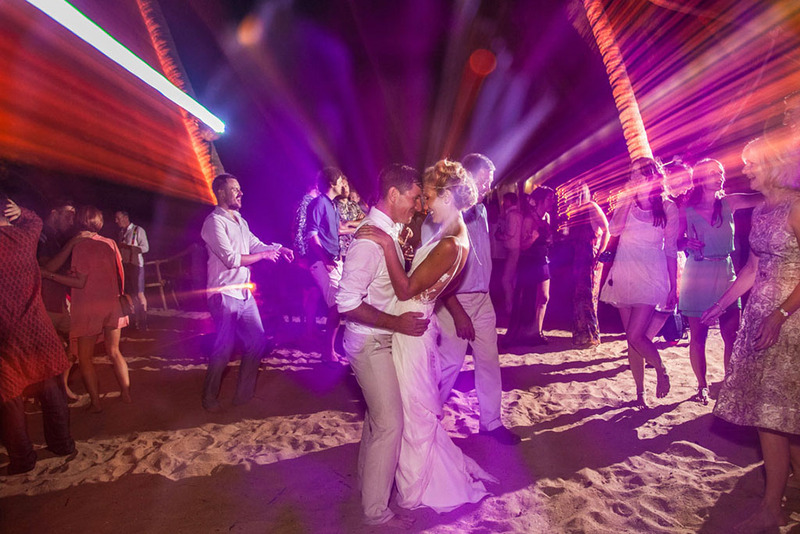 We limit the number of our wedding bookings each season to give 100% to every couple. Goa is blessed with pristine stretches of golden sand and the clear emerald waters of the Arabian Sea, with a backdrop of low mountains and lush rainforest. Whether you’re planning a romantic private ceremony – or seeking a venue spacious enough to accommodate 100+ guests – we will help you find the perfect backdrop for your big day. From a Rajasthani tented resort on a stunning secluded beach, a Portuguese Palacio, to a luxury beachfront lounge bar, a gorgeous garden villa estate or a contemporary boutique hotel on the banks of a beautiful river. Whichever location you choose, the space can be styled to your individual taste, with your choice of catering and entertainment brought in. 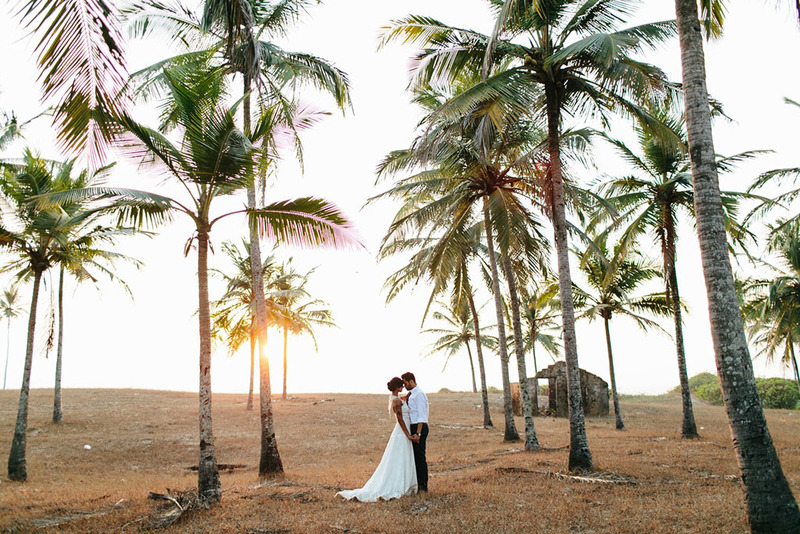 So, whether you envisage a simple beach wedding or holding an extended celebration at an ultra-luxe hotel, we can use our unrivalled local knowledge and contacts to find a breathtaking setting for your beautiful wedding in Goa. It could be a colourful Hindu wedding beneath a mandap of opulent Indian fabric, the priest leading the couple through the sacred seven steps to a soundtrack of traditional Indian tabla and sitar. Or a Catholic wedding in one of Goa’s pretty whitewashed churches that peek through the palm trees. For a spiritual blessing in Goa the possibilities are endless. 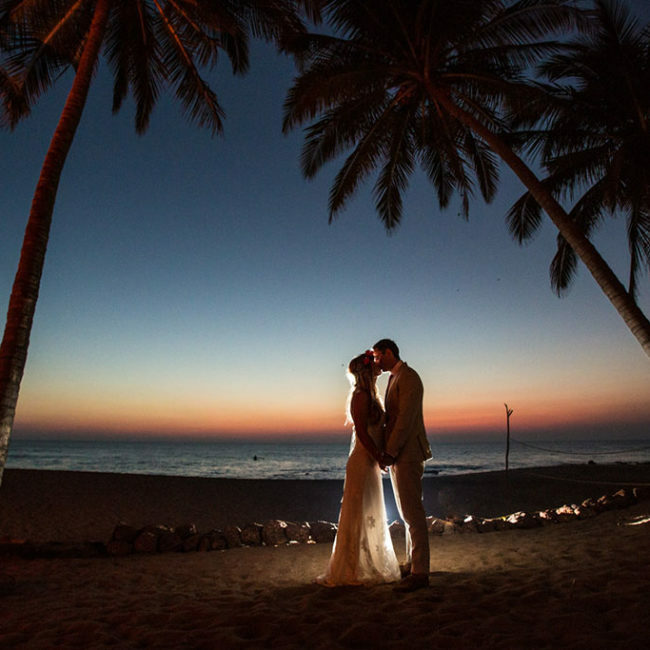 You could decide to be married under a canopy of tropical flowers overlooking the beach at sunset, exchange vows in the garden pagoda of a Portuguese Palacio, or have a intimate moonlit service to the sound of the waves. 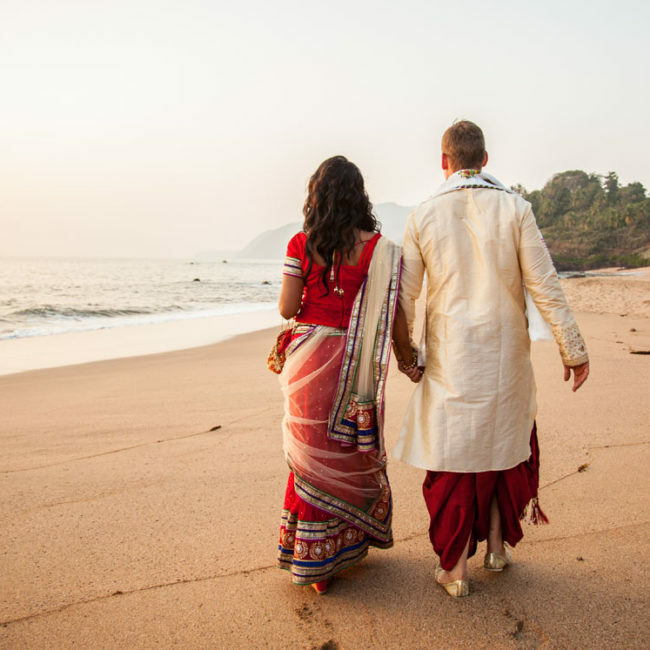 Even if you’re a non-resident, it is possible to be legally married in Goa with the local registrar. We oversee the whole process from obtaining the court order to delivery of the wedding certificates. However, for most people a civil ceremony before coming away is the most straightforward option. 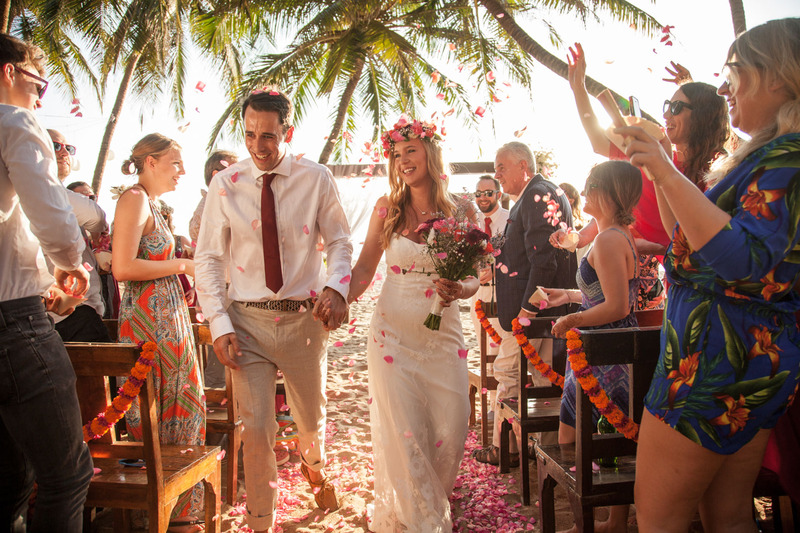 You can then have your ‘wedding day’ in Goa to celebrate your marriage. We offer a full wedding design service, working with you to create inspiration boards covering overall themes and colour palettes, right down to the tiny details that will ensure your day is styled to perfection. Whether you’re dreaming of a soft romantic look, classic white beach styling or a riot of Indian colour, we will work to translate this across your wedding. 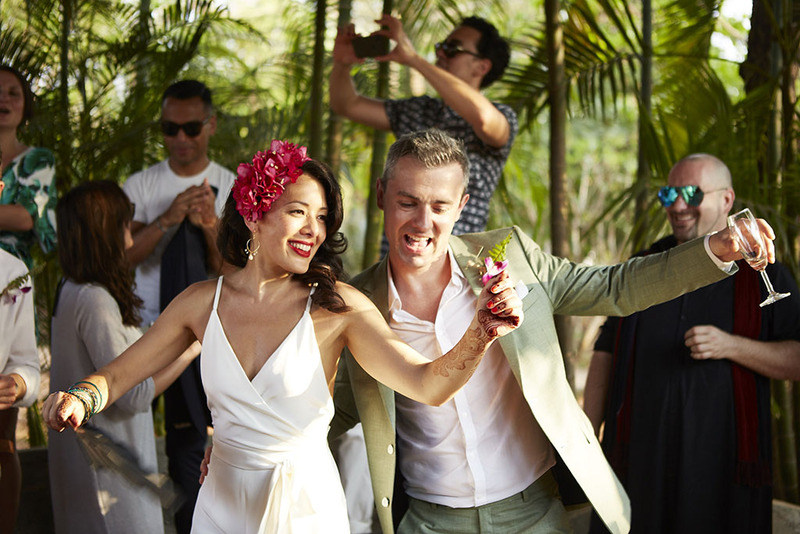 The ceremony could be held in a garden gazebo dripping with jasmine, a mandap bedecked with sari material, or a bohemian beach set up of wood and shells right on the sand. We then continue the design concept to create a stunning evening scheme: beautifully dressed dining tables, lanterns hanging from the trees, chill out areas, fairy lights, the whole space lit with hundreds of tiny candles. And all complemented by gorgeous florals, from the bridal bouquets to table arrangements. Whatever your style – from contemporary elegant to vintage chic – we will ensure your wedding is beyond beautiful! From helping you plan a personal ceremony to designing the perfect look for your day, we work with you to hand pick a team of vendors and entertainers, build a style profile, manage rentals and find resources, and take care of all the paperwork, budgeting and event preparation. When the big day finally arrives, our flawless coordination means you can completely relax and enjoy an effortless and unforgettable celebration. A champagne brunch for morning weddings – or for the morning after! 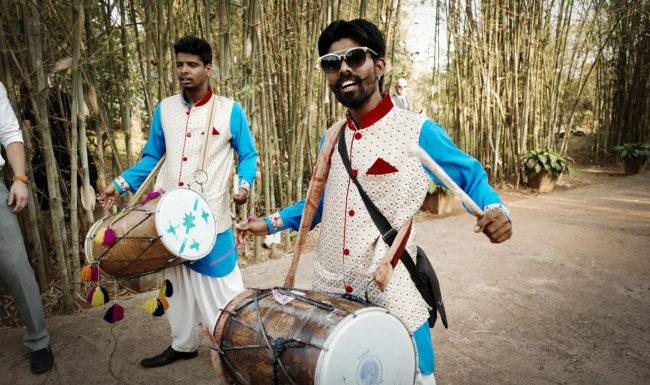 When it comes to entertainment, Goa is famous as a hedonist’s heaven, and Walking on Sunshine has an unrivalled contact book of DJs, performers and fire dancers. But, if you’d prefer a more subtle soundtrack, folk musicians, a funk DJ or a jazz band are just some of the other options. And what better way to complete your celebration than a dazzling firework display over the Arabian sea. 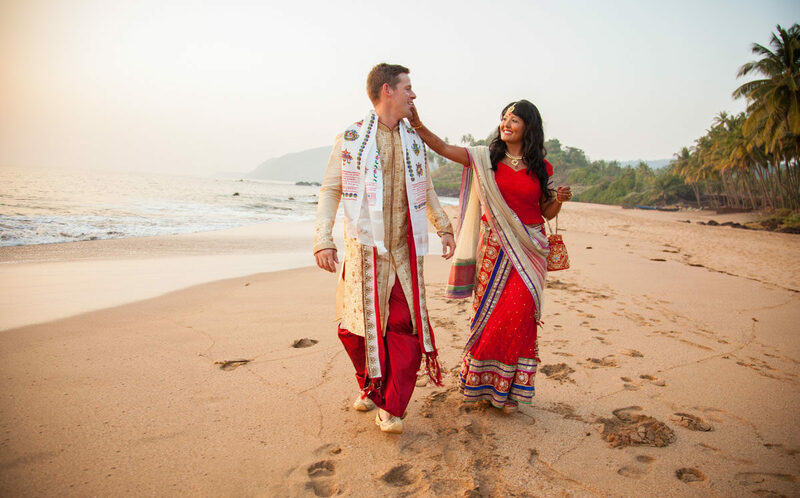 With people coming from all over the world, extended celebrations are a way for the wedding party to get to know Goa and each other before the big day – and to recover together afterwards! We can plan a pre-wedding pool and pampering day, arrange group activities, put on a welcome dinner, or a post-wedding brunch complete with a detox/retox bar and therapists to give tired guests a mini massage. 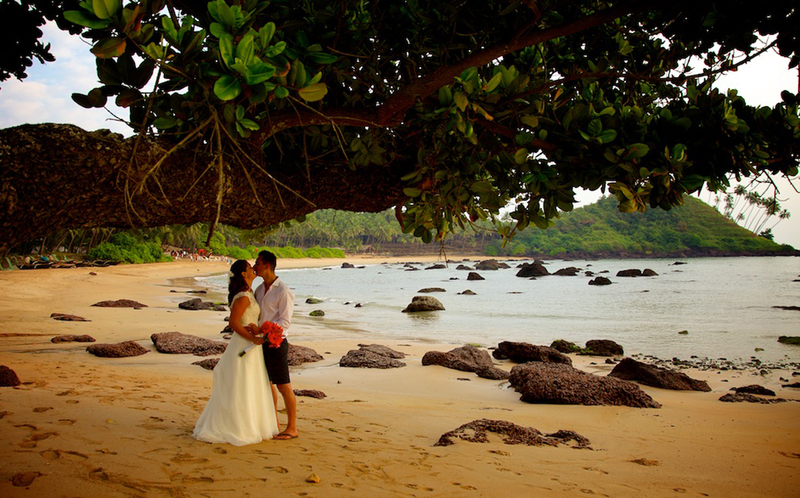 Just let us know what you would like to complete the Goa wedding party of your dreams. Professional wedding photography and videography to capture your day. Images on this site courtesy of Cory Goldberg, Jessica Alexander, What the Fox Studio, Rahul de Cunha Pictures, Vrutika Doshi, Kim Cartmell, Matthew Weinreb and Mark Oakley. We work with KOKOindia, a bespoke travel company that can assist with group travel and accommodation, arrange exciting excursions for you and your guests whilst in Goa, and design dream honeymoons in magical locations across India. 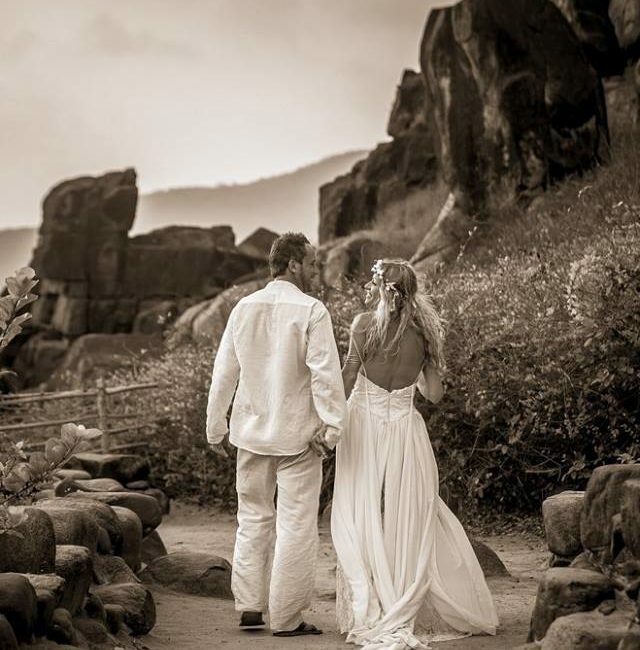 A countdown website to communicate with your guests about your wedding in Goa, tell your story, give travel and accommodation information, and offer tips for visiting India. Preparation for the bridal party. Pre-wedding manicures, pedicures and beauty treatments. Hair styling and make-up on the morning of the wedding, complete with breakfast and bubbly. Wedding day favours or gift bags for your guests. Bespoke stationery, from invitations and orders of service to menus and place names. Welcome packs with the wedding details, essential knickknacks, restaurant recommendations and sightseeing advice. Planning in India was a daunting task when tackling it from our home in London. 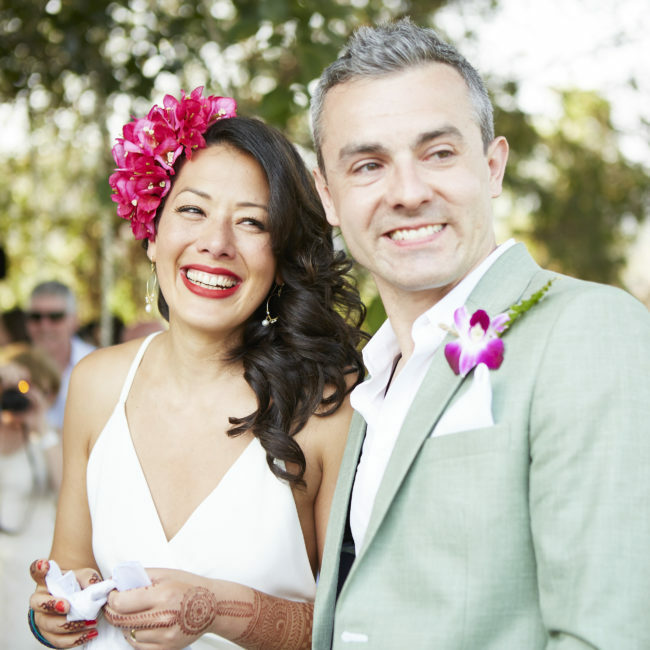 Lucky for us we found Tabitha and she helped create our perfect wedding. As well as being organised and methodical, Tabitha really understood our aesthetic and vision for the whole event. She had great local knowledge, pinpointing the perfect venues for each day of our 3 day celebration. To top it all off she was a laugh to hang out with. We highly recommend her services, worth every penny. Thank you Tabitha, it really was the perfect party. Our family and friends still rave about it being the best wedding they’ve ever been to! We can not recommend tying the knot in this gorgeous part of the world more! Everything about Goa means you can have the chilled , relaxed wedding but still with all the trimmings. Creating a very special and unique wedding. One of girlfriends described our wedding as the most mind blowing wedding they’d ever been to. And Avanilaya is the most incredible place we have ever been, and to have this as our wedding venue is the stuff dreams are made of. Walking on Sunshine Weddings were a pleasure to deal with. Tabitha is the right combination of relaxed yet she gets the job done. Our flowers & décor were stunning and exactly how I had imagined. Everyone from Tabitha’s team that worked on site on the day of the wedding was professional and personable with all our guests and were a pleasure to have around. I can’t recommend them all enough. I wish I could do it all over again. 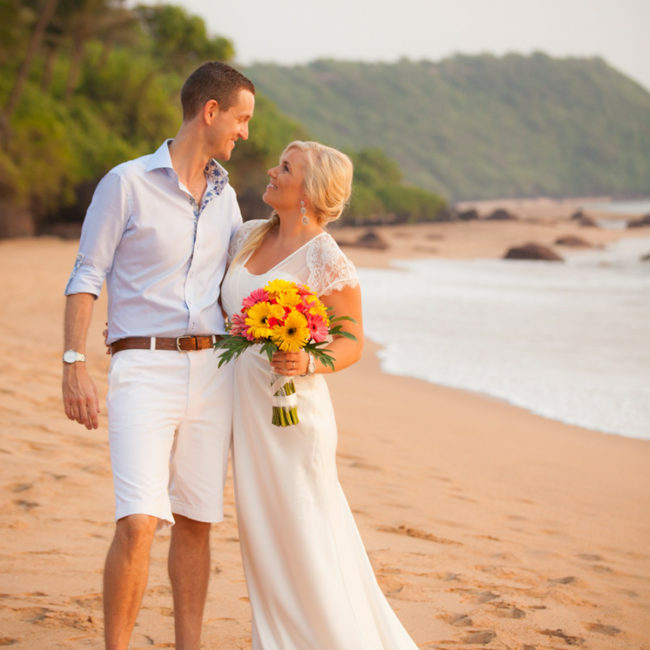 Our wedding day on Agonda beach in Goa was absolutely perfect thanks to Tabitha! We left everything in her hands and we couldn’t have asked for a better day! The venue was more than we ever imagined and the way it was decorated was beautiful. We had a BBQ on the beach just after sunset and the food was incredible. I just want to relive the day over and over again! 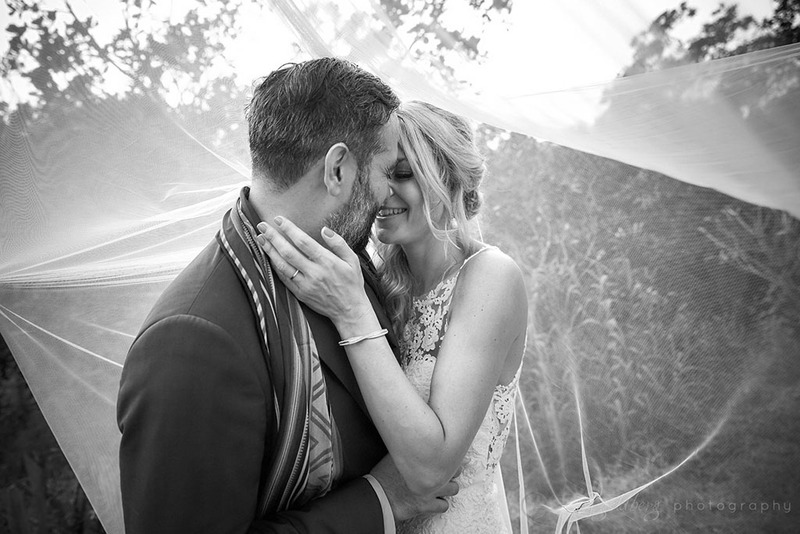 Walking on Sunshine made our wedding day so relaxed and enjoyable from the moment we started planning and I would recommend anyone who is getting married to let them plan your dream day! I think the best thing about having a wedding planner is that we felt so listened to, especially having a wedding overseas and having to trust someone with the details you might only see in your head. In all the photos of our reception, all we see are smiles! We wanted the focus of our wedding day to be all the people that we loved being with us as we celebrated our love. The atmosphere, the decorations, the setting and the food all made that possible. We apologise for breaking the dance floor because we were clearly having too much fun! 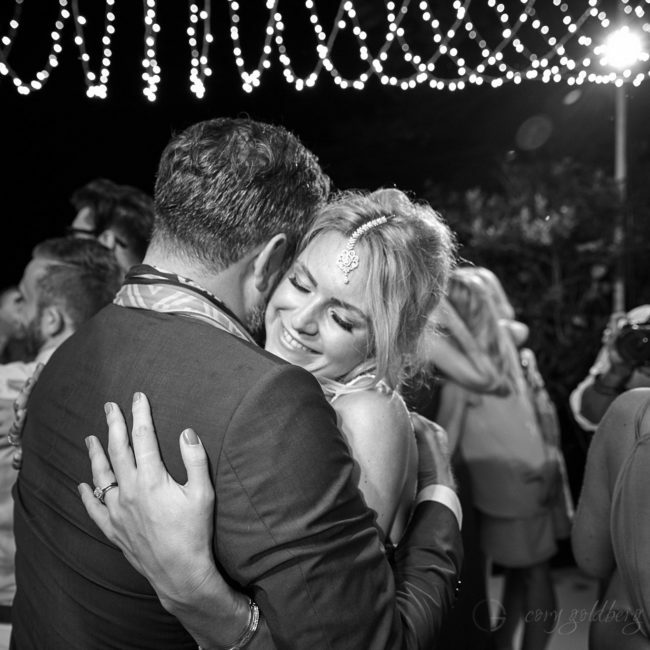 When I look back at our wedding, I could not ask for more than the love that we felt, the fun that we had and the joy that we saw in all our favourite people’s faces. Thank you for helping make that a reality for us. Our wedding was the best thing that ever happened!. We had the entire beach with beautiful rajasthani tents surrounded by coconut trees to ourselves. 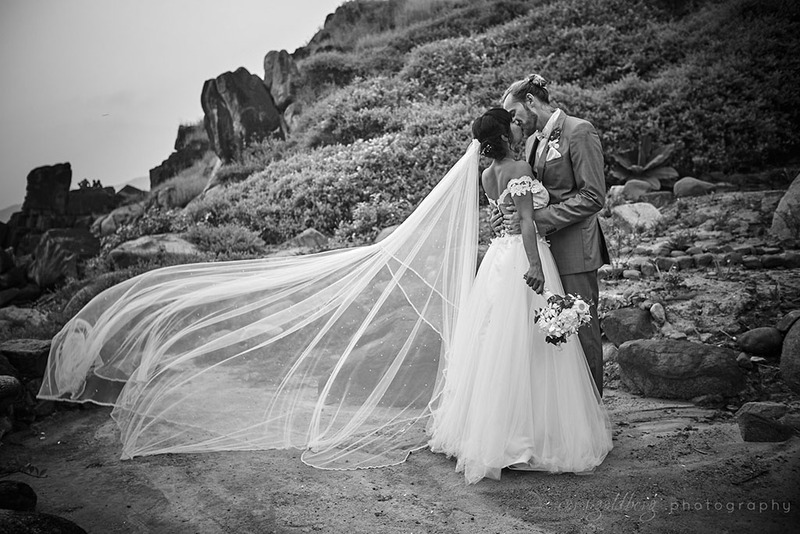 It was like having a wedding in a scenic private island with so much glam and nature. The decor, sunset cocktails, food, music, photographs, lighting and amazing fire entertainment were a dream come true. All these would have never been successful without the wonderful help of Tabitha and her amazing team. I am short of words to describe her professionalism – she has an amazing taste and she handled everything with such a flow and ease that everything felt so right. I am so glad that we found her to plan and organise the biggest moment of her lives. Our family and friends were stunned away to glory with the entire arrangement and can’t stop talking about it. We made memories that will have a special place in our hearts! 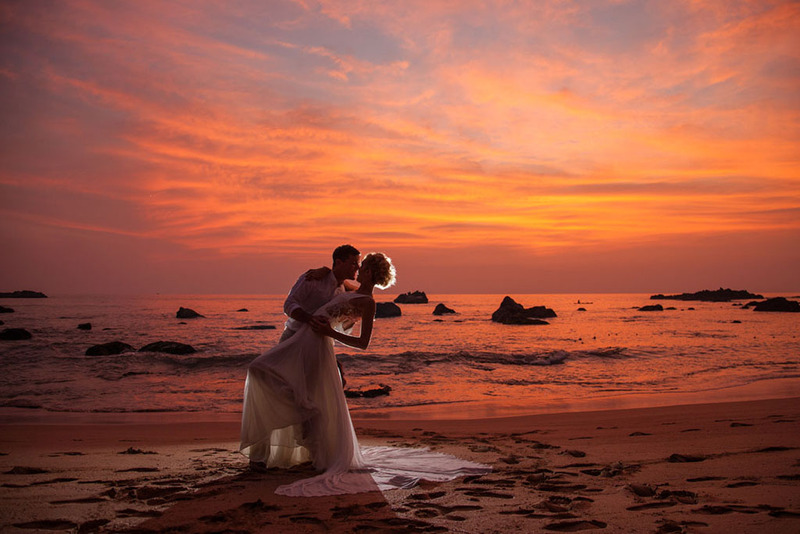 We have to say the overall experience of getting married in Goa surpassed our expectations in every way. It was like something out of a magazine! Walking on Sunshine were brilliant with their organisation and attention to detail, and they met our requests spot on. The location was amazing, the food could not be faulted, and the florals were even better than we hoped for. Also, on the day our playlist ran out, fortunately Tabitha had her own backup playlist to our taste, which was perfect. The whole day went smoothly thanks to Tabitha and her staff – having their experience helped immensely with the flow and timings. You can trust Walking on Sunshine to make your day so special, and we cannot thank Tabitha enough for making our day perfect in every way. The restored Portuguese Palácio where we had the wedding was exactly like it was in my dream of a perfect wedding. The decor was stunning as well as the food, and the traditional Indian musicians were very special. Everything was perfect and truly memorable. All our friends and family who came loved every minute. Tabitha was truly wonderful. Very professional but at the same time really easy to discuss ideas with. She created exactly the type of wedding we were looking for, and the organisation down to the finest detail was perfect.